Scratch is a tile-based visual programming language, which is an excellent first language for children to learn. We are providing a helper app that allows you to use Scratch 2.0 with Finch and Hummingbird. 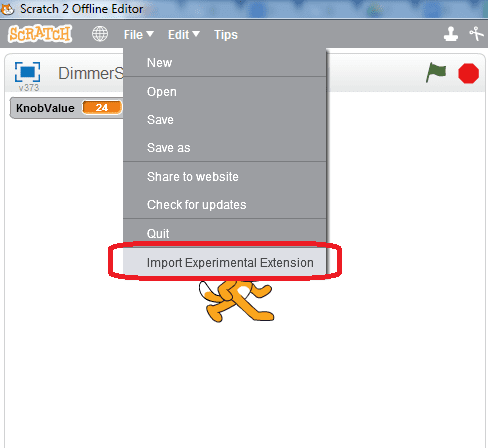 Finch’s Scratch library currently only works with Scratch 2.0’s offline editor. Install it from here. Visit the Chrome webstore to install the Finch Connection App. You do not need to install Scratch 2.0 offline if using a Chromebook, as we use the ScratchX website instead. Start the BirdBrain Robot Server helper application. It should show that the Finch is connected. 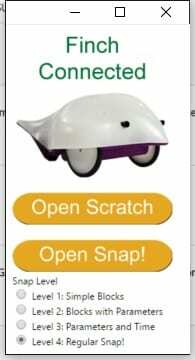 Start Scratch 2.0 by clicking on “Open Scratch” in the BirdBrain Robot Server. 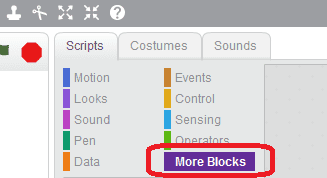 In Windows and Mac, the Finch blocks will show up in the “More Blocks” category. Download the zip file containing the Finch and Hummingbird extensions, as well as a few example programs. The Finch blocks will now be in the More Blocks category. Click the Open Scratch button on the app to automatically load a ScratchX page with the Finch blocks loaded, and accept any prompts when the page loads. Click Enable Flash if needed. Move Finch left: right: Sets the power to the left and right wheels. The range is -100 to 100; for example Move Finch left: 100 right: 100 is full forward, left: -100 right: -100 is full backwards. Finch LED color R: G: B: Sets the color of the Finch’s beak. The R, G, and B arguments control the intensity of the red, green, and blue elements in the Finch’s beak. Range is 0 to 100 for each color. Finch buzz at Hz ms: Plays the Finch’s buzzer with a sound of the frequency specified for the time specified. Range is 20 to 20,000 for frequency. Finch temperature: Returns the current temperature in Celsius. Finch left light and right light: Returns the intensity of light hitting the left or right light sensor. The values are in a range from 0 to 100 where 0 is total darkness and 100 is saturation of the sensor. Finch left and right obstacle: These are boolean or predicate blocks, returning true if an object is 1-4″ from the sensor and false otherwise. Finch X/Y/Z Acceleration: Returns the current g-forces measured along the Finch’s X (beak to tail), Y (wheel to wheel), and Z (top to bottom) axes. Range is -1.5 to 1.5 gees. Finch Orientation: Returns the current orientation of the Finch. Possible responses are Level, Upside Down, Beak Up, Beak Down, Left Wing Down, Right Wing Down, and In Between. The Speak block will cause the computer to say whatever text is placed in the box. Loops with just Finch command blocks seem to run just once instead of looping. Add a non Finch/Hummingbird block into the loop to make the loop work (a good dummy block is a “Wait 0”). In Mac, if both Finch and Hummingbird are plugged in, you may see a 5-10 second delay after you try closing the server, and you may get an error message on close. In Mac, occasionally the application will not quit when you try to close the window – end the process with force quit. If the robot seems to stop responding for any reason, there is no need to close Scratch. Close the BirdBrain Robot Server application instead and re-open it. If the “Open Scratch” button on the BirdBrain Robot Server does not open Scratch, or opens Scratch without the Finch blocks loaded, you can load the Finch extension file manually. The Finch Connection App for Chrome must stay visible on the desktop if using it with a Macbook running OS 10.9 or later. If the app is minimized, sensor values will stop updating and output commands will be sent very slowly.